Shri Guru Ram Das Ji: An Inspiration to All! Guru Ram Das Ji was the fourth of the Ten Gurus of Sikhism and was given the title of Sikh Guru on 30 August 1574 at Goindwal. He was the founder and planner of the famous township of Ramdaspur which eventually became the Sikh holy city of Amritsar. Born on September 24, 1534 at Chuna Mandi (Lahore), initially he was named as Bhai Jetha Ji. He got married to Bibi Bhani ji who was the daughter of Guru Amar Das Ji. Prithi Chand, Arjan Dev and Mahan Dev were his three sons. As he grew up, he loved to be in the company of Holy men. Guru Ram Das ji spread the message of selfless service to the humanity without any discrimination of gender, caste, color, creed and country. He emphasized on leading simple living and high thinking. He also constituted the Massand Institution to look after the growth and development of Sikhism. His Bani is compiled up in Sodar Sahib and Kirtan Sohila (regular prayers of Sikhs). Guru Ji not only founded the Amritsar city but strived to ensure the commercial and all-around development of the city through different trade ventures. Eventually, it has become a flourishing trade centre and a place of distinct pilgrimage for Sikhs. It is him who dugged up the pool of Harmandir Sahib Ji or Golden Temple. The excavation of the holy sarovar (pool of nectar) is the symbol of spirituality that strengthens the Sikh unity. The holy city of Amritsar was also known as Guru Ka Chak. He bestowed Guruship on his youngest son Guru Arjan Dev Ji. Guru Ram Das ji left for heavenly in 1581 at Goindwal. I request everyone to follow his principles and lead a spiritual life. 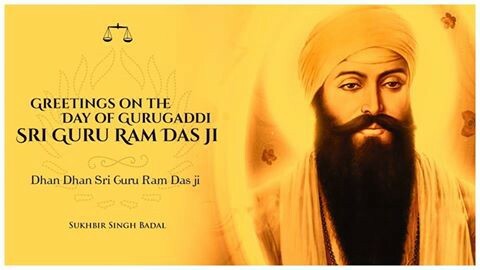 Wishing you all the happiness on Guru Ram Das Ji’s pious Gurgaddi Diwas! Sukhbir Singh Badal (born 9 July 1962) is the President of the political party Shiromani Akali Dal.